One of the largest Mycenaean tombs was brought into light this summer, on a mountainside in central Greece. It is a major archaeological discovery, which will shed new light on Mycenaean funeral practices. 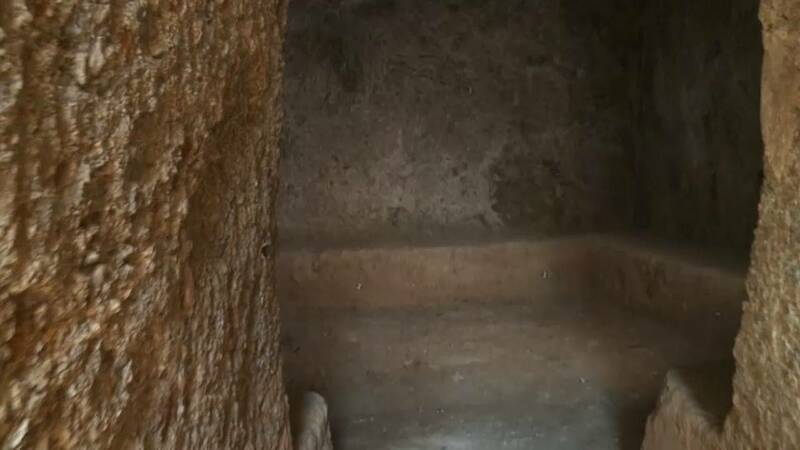 The monumental chamber tomb dating back to the 14th century BC, is accessed through a 20 metre long rock-cut passageway. But it’s the partial collapse of the original chamber roof that has been most helpful in preserving the burial. This burial is very important. It is unique because it wasn’t looted or disturbed. It contains all the grave gifts of the dead person, placed alongside his remains. All these help us understand that he was a male, someone rich, from the upper echelons of the local society and palace. The dead man in the tomb was thought to be 40 or 50 years old and was buried alongside clay vessels, horse bits, arrows, pins, jewelry, combs, a sealstone and a signet ring. The wealthy person came from the nearby Orchomenos. Orchomenos and Thebes were two of the most important centers of the Mycenaean period. Exhibits and grave gifts from other tombs in the area (Boeotia) are displayed in the archaeological museum of Thebes. The discovery is the result of the cooperation between the Greek Ministry of Culture and British School at Athens-University of Cambridge. The objects discovered will now be taken to be studied to see if any more secrets of the past can be revealed discovered.